I was very very surprised to see how big the packaging is. In my head, I thought it would be the size of the blush and each multiple would be the size of half the blush. 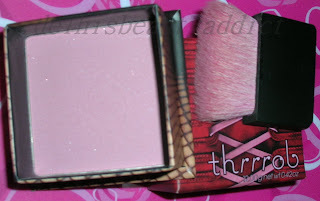 I adore both the colors and I find the texture of the Multiples very interesting...smooth yet neither sticky nor oily. The pigmentation is also "Just Right"
Buy Again? Absolutely! In other colors, of course. This is too sheer to be worn alone, so I like to layer it over a cream blush. It does bring a nice glow to the face. The brush is nice, not to mention the fabulous corset box. But I can live without this for sure. Omg this smells *sooo* good! Ironing does go smoother with this on my hair. I haven't used it much, but I know that even if it does not improve my hair, I'd still buy it again for the lovely smell. WOW! These are amazing. Tweezing feels so effortless with them. They are sturdy and they grip the hair so tight that you don't have to worry about not pulling from the roots. I love that they come in a vial and has a tip cover, this ensures that the tweezers will always be as good as new even when you carry them in a stuffed make-up pouch/bag. Buy Again? I don't think I'll need to. But if I had to, Y-E-S. I hope these reviews will be useful to some who are thinking about trying these products. Great haul, everything looks essential to one's collection~! does the chi serum leave your hair feeling greasy at all? Loveeeee chi silk infushion. Smells like a yummy boy. A chi sales rep once told me that she puts in on her skin sometimes. I started to do that and its fabulous. the nars duo looks absolutely pretty on you. i love your makeup ha! soft and sweet looking. These looks really pretty.You make up good. I LOVE tweezerman tweezers! I honestly can't live without them, and nothing compares. They're really worth the money. My only problem is that they keep on releasing them with new designs and I want them all!! Thanks for the lovely comments all. The Nars Duo n tweezers r my favs. @QOM..Thanks for the advice girl..I had been planning to do that for a while now but fell sick so have to wait. cynthia... u r such a darling... read lot of ur reviews.. awesome.. cant believe u r married.. u look soooooooooooooooooooooo young n soooooooooooo sooooo sooooooo pretty... i have a straightening iron too.. wt brand do u use.. pls let me know. n plsssss tell me whr to get CHI fusion in chennai and also loreal hairmix. i need a product to use b4 ironing as heat defence. wt can i use. pls help me. i can even mail u my pics so u can sugest me some products. also makeup for my skin color n type..
Aww...thanks a whole bunch for yr sweet compliments. I don't think Chi is sold in India yet, but I guess u can find loreal Hairmix in salons that keep loreal products in Chennai. Email me anytime. TC! Hey, where do you find Tweezermans in India? Specifically, in Delhi?